If you were to try and venture into your local Disney Store or into a story inside a Disney Park, you’d probably not notice that there is something missing in all of them. It has nothing to do with how the stores operate or the design of them, but just an item. An item that has grown to massive popularity thanks to its origin. It’s sold out pretty much everywhere and quantities are quickly bought up as soon as they are out on the racks. We’re talking about the dress of Queen Elsa of Arendelle. Ever since we first met her in her hit animated film “Frozen”, the icy dress that Elsa creates for herself has become an item that girls (both young and younger) have sought to have themselves. Fortunately for those girls, Queen Elsa has graciously allowed mass reproduction of the exact dress she has. The process of turning an animated dress into a real one, though, isn’t the easiest thing to do. Just like anything that Disney does, the attention to detail and story for even something as simple as a costume is made complex because it needs to be made right and that responsibility is given to the folks in the Disney Theme Park Merchandise Department, the folks who also create the rest of the souvenirs you need to bring home with you. 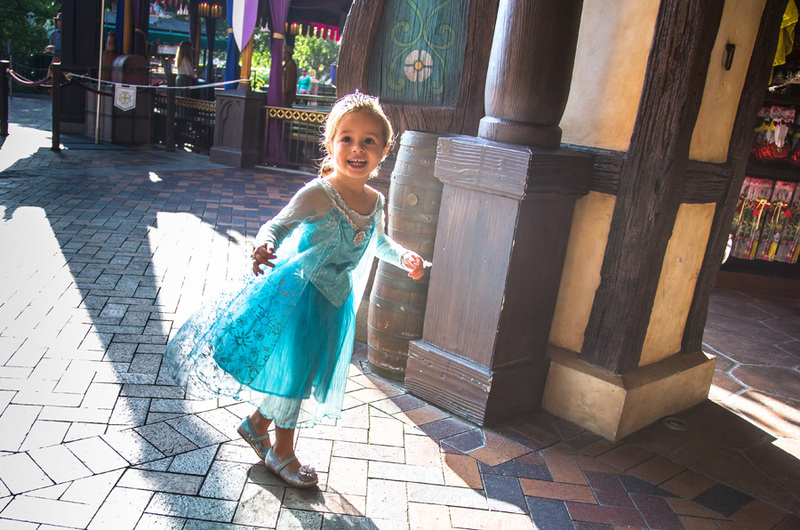 Michelle Harker, the Merchandise Marketing and Communications Manager for the Disneyland Resort, spoke with many of those who worked to create the Elsa dress. Starting with design, an artist meets with the animators who created the dress digitally for the film to find aspects of it that are most recognizable and must be in the real dress which in this case was the color and striking snowflake patterns. From there, it’s off to finalizing the design and picking the materials to produce it. Working in partnership with vendors, both the merchandise department and the artist work together to find materials that match the design, but that can also last. Just like with wedding dress designers when they choose the specific fabrics, colors, and patterns for their dresses, Disney does the same thing even with creating Elsa’s dress. Once the materials are chosen, it’s off to production and ultimately into stores and with girls who feel like they can’t “hold it back anymore”. Elsa’s dress is just one of the many items that Disney takes so much pride in just like the rest of their businesses. With every Elsa dress, Hipster Mickey print, or Turkey Leg air freshener they create, it’s all about bringing the Disney stories you love into more aspects of your life. For the designers, artists, and everyone else involved, the gratifying feeling that they get when they see the product with a customer and the happiness they get for having it makes it “a dream come true” for them, too. Will you be buying an Elsa dress any time soon? What Disney souvenirs do you still hold on to? Why do you still on to that particular item? Do you appreciate the efforts made to bring more Disney into your lives? Comment below! Next story After Happily Ever After.